In the new version, we still have the SqlDatabase and OracleDatabase class – but we also have a new GenericDatabase class. The GenericDatabase can be used with any .NET managed provider (including the ODBC and OLE-DB providers that ship with .NET) – but the catch is that it doesn’t support all of the DAAB functionality. Most significantly, the overloads that use parameter discovery do not work (since these methods aren’t supported on .NET’s DbConnection or DbCommand classes). There’s still the option to build your own Database-derived classes to support this advanced functionality and provide improved database transparency – this is why we built SqlDatabase and OracleDatabase – but at least you’ll be able to use most of the block against any type of database. Since I installed Firebird, I have been itching to write a custom Database for Firebird in the EntLib 2.0 framework. I know there are customers who want to do this as well because they have Sybase, DB2 in their environment. The GenericDatanase would be an option with ODBC and OLEDB. But for the long term, it makes sense to leverage the native ADO.NET providers if they do exist. /// Holds the optional mappings from ADO.NET's database providers to Enterprise Library's database types. 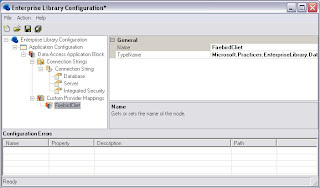 This shows that the configuration drives the creation of the custom Database, if any. So I openned up the EntLib configuration console and now the "Custom Mapping Providers" made sense - all we have to do is to provide a mapping between a name and a custom Database type. This entry was posted on 1/21/2007 08:54:00 PM . You can follow any responses to this entry through the RSS 2.0 feed. You can leave a response, or trackback from your own site. It is first time to read your blog,and feel it's so helpful to us, thanks. Hope more articles can be shared.